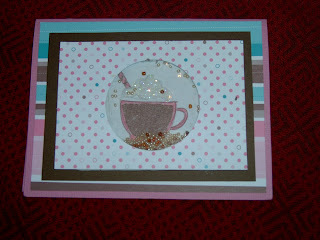 Dawn from Dawns stampin thoughts did a tutorial on this Card not this motiff but my friend cheryl and I decided to use I like it a latte set to do this. It was cheryls cs so I believe it may have been some of her old cm paper we used. I love these shaker cards I am gonna make a couple more with different sets. I HAVE YET TO TRY THESE. YOURS IS VERY CUTE!